If you haven’t seen it yet, do watch our Alisson save video as the Liverpool goalkeeper produced a moment of absolute magic against Napoli on Tuesday night. 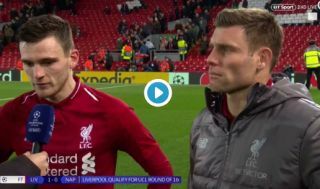 The Brazilian has proven a huge signing for Liverpool, and James Milner and Andrew Robertson were clearly pretty blown away by him as well. Watch their interview below with BT Sport as they both describe Alisson’s save as ‘unbelievable’, which just about sums it up. As well as the usual plaudits about the fans and the work rate of the team, it’s clear both realise just how important Alisson was to the result tonight that ensures LFC go through to the Champions League last 16. "We know what Anfield is about on European nights." Mohamed Salah’s first half goal was enough in the end, with Liverpool showing this season that they can win ugly as well as play the kind of scintillating football that saw them reach the Champions League final last season. Could the form of Alisson this year mean they’re now serious contenders to win the thing?